Nick Kuperwasser somersaults in the sand after making the shot at the summer Rhino Cup volleyball game. The annual Rhino Cup volleyball league stokes the competitive fires of Harvard’s biological community, drawing researchers out of the lab and onto the sandy volleyball court at the Biological Laboratories. The finals are Aug. 29. 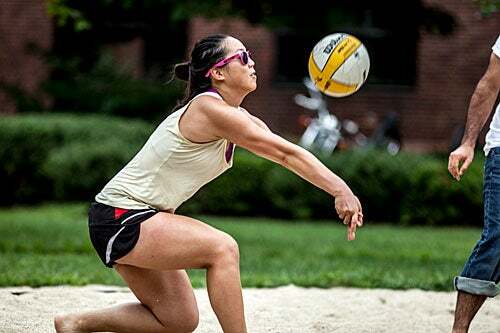 Like any good summer sports league, Harvard’s Rhino Cup volleyball tournament features sun, sand, sweat … and scientists. For more than 20 years, the inhabitants of Harvard’s labs have ducked outside after Commencement, playing weekly games through the end of August. Science comes first for most of the year, but when warm weather rolls around, wins and losses on the volleyball court give lab results a run for their money. The hourlong weekly games build camaraderie among lab members, Rinn said, giving them a break from their work hunting for new human genes, as well as a bit of exercise. Rhino League Commissioner Lance Schumacher, a technician with Harvard’s Office of Environmental Health and Safety, recalls seeing the volleyball court on the way to his job interview and describes something akin to love at first sight. “I walked through the alleyway and saw the court. I said, I better get this job,” Schumacher said. The league’s murky origins stretch back to an ’80s community-building effort by Cabot Professor of Biology Richard Losick, whose group played teams from other labs on a rough court in the Biological Laboratories’ courtyard. Michelle Chantries goes for a save at the Rhino Cup volleyball league game where scientists compete for the Rhino Cup, named for the statues that grace the courtyard of the Biological Laboratories. The league, named after the life-sized bronze rhino statues that have flanked the Bio Labs’ entrance since 1937, is open to all Harvard ID holders and includes a significant part of Harvard’s Cambridge-based scientific community, with 300 to 400 participants on 39 teams. The league remains dominated, however, by teams from the chemistry and biology labs in the buildings nearby. After weeks of regular season play, teams this month are deep into the double-elimination playoffs. The last four teams standing will face off in the finals on Aug. 29, with the winner getting the Rhino Cup, which shows the animal perched on a lab cylinder while balancing a volleyball on its horn. As commissioner, Schumacher — who wants to have his title changed to Rhino League “Czar” — manages the complex schedule and settles disputes, with an eye more toward fairness and fun than hard-core competition. Most of the league’s rules have grown organically, in response to complaints over the years, Schumacher said. Games are played by pre-1999 rules, with scores to 15 and only the serving team able to score points. To even out competition, different divisions were established to separate teams more interested in competition from those mainly interested in fun. To keep the four- or five-games-a-day schedule running smoothly, the games go on rain or shine — unless there’s lightning. And to keep teams from bringing in ringers, players have to hold that Harvard ID, though there’s one exception: Past players are always welcome. “Once rhino, always rhino,” Schumacher said. Rhino Cup playoffs continue today through Aug. 29. For more information, including teams and times. Discussing the benefits of Harvard’s summer jobs program are Thelora Marseille (from left), who this fall will attend the University of Massachusetts, Boston; Lisa Maxwell, assistant director of employment at HGSE; Tewodrose Woldemariam, who will attend Regis College; and Eunice Offre, who is bound for Colby-Sawyer College.